The Smart Energy Storage & Micro Grid System (SES System) is an intelligent, distributive, power interchange which locally stores, manages and directs renewable and grid energy. This technology intelligently buffers and balances renewable grid fluctuations and can allow for power company ownership, equating to customer sales through renewable generation. This same system also provides a turnkey off-grid renewable (and intermittent) energy supply system. Fitted with the latest 3000+ cycle (up to 20 years) battery technology that offers high charge/ discharge rates; it is exciting to comprehend that this can all be diligently controlled using a smart phone. The system has great scalable variance, powering a one-bedroom apartment up to anything resembling a large metropolitan city and beyond. Energy has a large number of different forms, and there is a formula for each energy source. Kinetic energy, gravitational en­ergy, heat energy, elastic energy, elec­trical energy, chemical energy, radiant energy, nuclear energy and mass energy. We can total the formulas for each of these inputs, however they will not change the simple equation of energy going in and out. For a simple electrical energy denomination, the measurements are calculated as: 1 kWh = 1000 Wh. Currently our energy infrastructure heavily depends on fossil fuels like oil, coal and gas. Fossil fuels are millions and millions of years of solar energy stored in the form of chemical energy. Humans are depleting fossil fuels much faster than they are being generated through the natural photosynthetic process and that is creating a problem. Therefore, fossil fuels are not a sustainable energy source. Almost 20% of all the World’s second­ary energy is used as electricity, which is a form of en­ergy that can be easily and cheaply transported with relatively small losses through an electrical grid. Approximately 65% of the electricity is gen­erated using fossil fuels, where coal is the leading contributor. 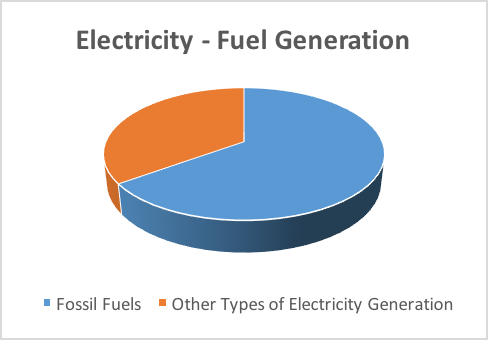 Of all the electricity that is generated, up to 39% is used for residential purposes, 45% is used commercially, 12% is lost in transmission, 3% is contributed to direct use and transportation is responsible for 1%… as documented on the graphs/ diagrams below. Thermodynamic efficiency is when the photovoltaic device is seen as a thermodynamic heat engine. This heat engine operates between two heat reservoirs; a hot one with temperature TH and a cold temperature TC. For the heat engine, three energy flows are relevant. First, the heat flow QH from the hot reservoir to the engine. Secondly, the work W˙ that is performed by the engine and thirdly, heat flowing from the engine to the cold reservoir that serves as a heat sink.